While we were outside today enjoying the warm spring weather, a turkey buzzard dropped down from its normal higher soaring altitude and buzzed the back yard. I got this shot with my Canon SL1 EOS and the 300mm telephoto lens. 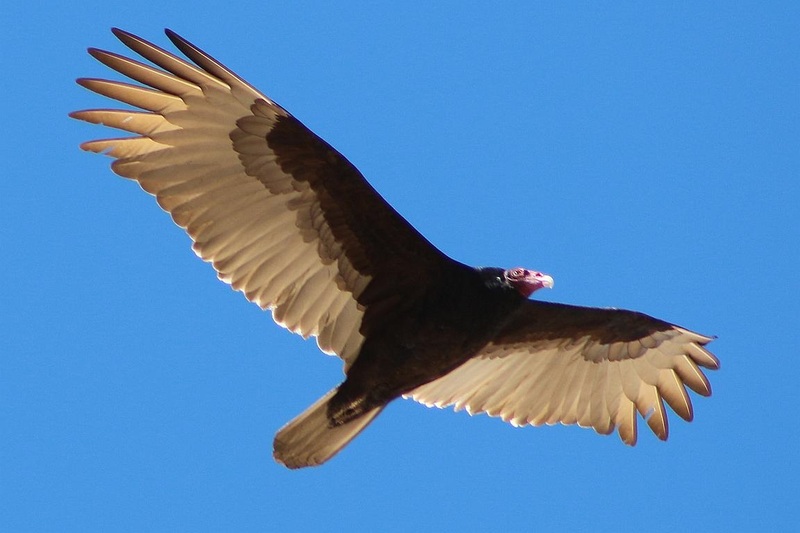 The turkey vulture received its common name from the resemblance of the adult’s bald red head and its dark plumage to that of the male wild turkey, while the name “vulture” is derived from the Latin word vulturus, meaning “tearer”, and is a reference to its feeding habits. The word buzzard is used by North Americans to refer to this bird. The bird didn’t stay long and swooped away on its quest for desert cadavers. Click on the image to enlarge. 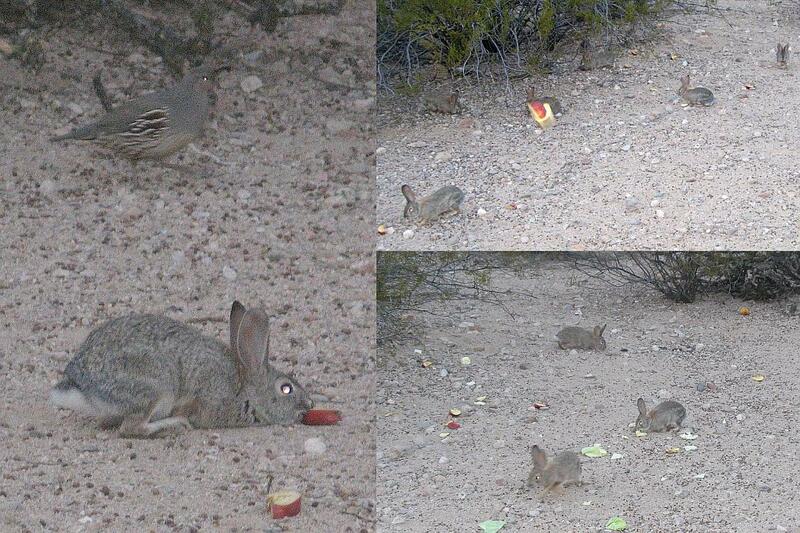 At dusk every evening these days, we take a bunch of bread, veggies and fruit up to the retention wall in the back yard and toss the goodies out for the quail, rabbits and other creatures that inhabit our back yard. The rabbits come running when they see us and begin devouring the stuff. The Quail, being a bit more wary, will snap up bread pieces and run up the hill with them without getting too close to us humans. A few of the bunnies will come very close to us in order to get the goodies. However, when there is a sharp noise or other disturbance, they quickly retreat to shelter in the underbrush. 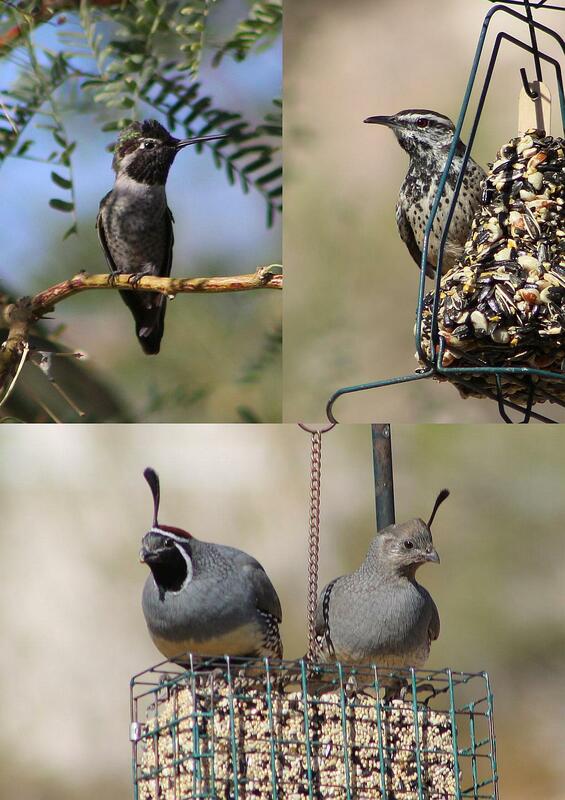 Hummingbird in a Mesquite Tree, Cactus Wren on the Seed Bell and a Pair of Quail on the Seed Cake. Click on the image to enlarge. Now that Second Spring is upon us and cooler temperatures prevail (only 92°), we have resumed our periodic visits to the Wickenburg Dog Park. Bay Bay and Cabela were off-leash for the duration of our visit today as we walked a couple of laps around the park. We will likely visit the dog park again when the weather permits as it likely will during the fall and winter months and into spring. 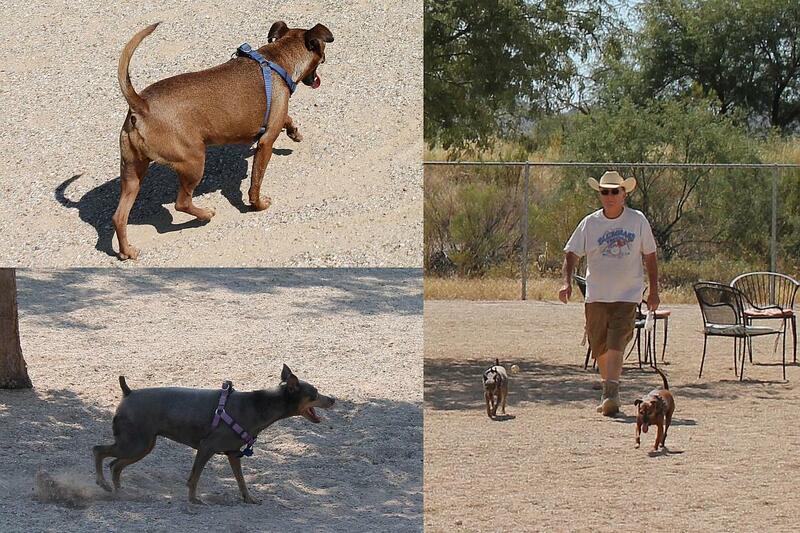 As you can see from the composite photo above, we all enjoy ourselves when we visit the dog park. Photos courtesy of Verna. Click on the image to enlarge. I was up on the hill behind the house looking at some of the vegetation up there when a Curve Billed Thrasher lit atop the bird block feeder. 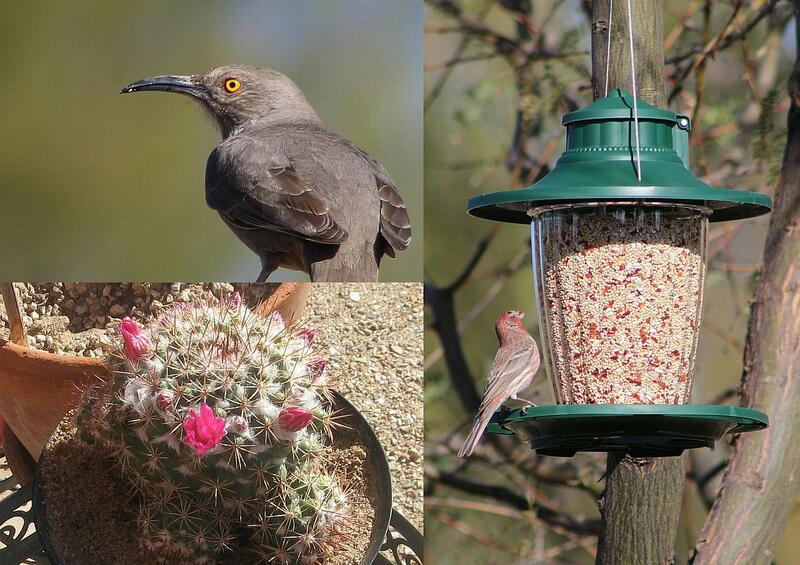 I had my camera and 300mm lens with me so I took several shots of the bird before it flew away. The curve-billed thrasher (Toxostoma curvirostre) is a medium-sized mimid that is a member of the genus Toxostoma, native to the southwestern United States and much of Mexico. Referred to as the default desert bird, it is a non-migratory species. 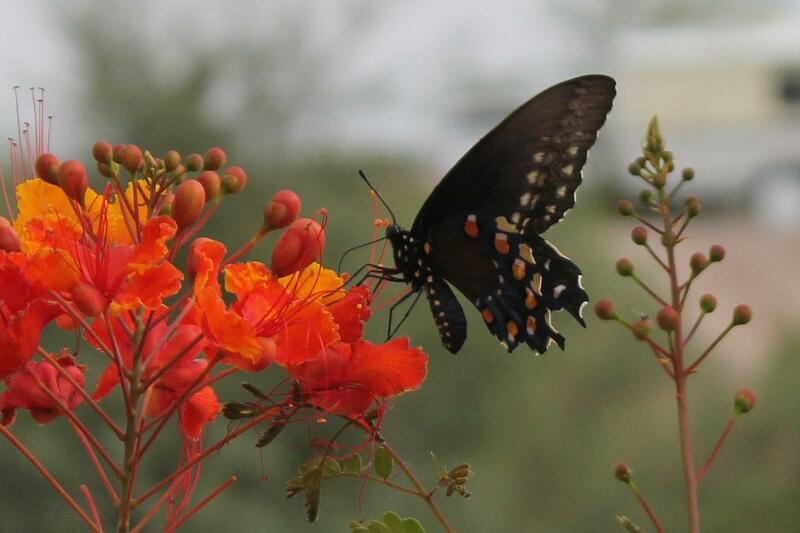 Several subspecies have been classified since 1827, though there is no consensus on the number. Allopatric speciation is believed to have played a major role in the variations of the curve-billed. It shares striking similarities in appearance with another Toxostoma member, Bendire’s thrasher. Nevertheless, it is recognized for its grey color and sickle-shaped bill. It generally resides in desert regions of the United States and Mexico, but can inhabit areas predominately populated by humans. 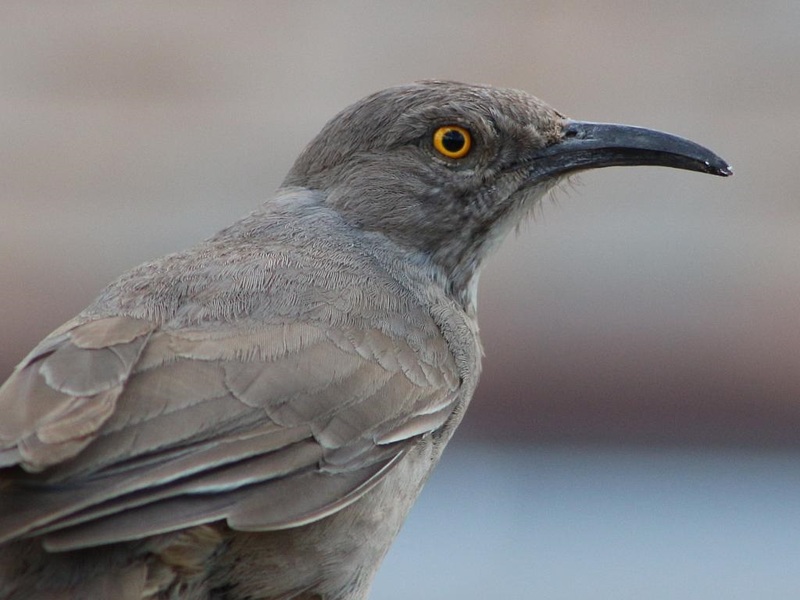 The demeanor of the curve-billed has been described as “shy and rather wild”, but it allows humans to view it closely. It is very aggressive in driving out potential threats, whether competitors for food or predators of its chicks. The curve-billed thrasher sometimes mimics several other species, though not to the extent of other mimids. It has a variety of distinctive songs, and this extensive repertoire of melodies has led it to be known as cuitiacoache (songbird) in Mexico.